Painting eyes within a portrait may instil fear in the beginner, causing a diffident approach. Eyes may end up lacking colour or shading, except in the irises and the pupils, resulting in a blank look. The slightest inaccuracy around the eyes may result in a portrait that does not look quite like the subject. How does the beginner tackle painting eyes for the first time? Forgetting that eyes have contours and shadows around the eye itself, as well as on the eyeball, and painting the skin colour as merely beige or pink. Good quality thin sable brushes are crucial. Size 0 or 1 for detail and highlights are ideal. Size 3 and 6 are good for applying small areas of light and shade around the eyes. 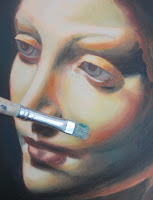 Blending the colours will add softness to the eyes. Satisfactory skin colours can be found in burnt sienna, permanent rose, burnt umber, cadmium red and white, although other colours will be seen. Avoid paint tubes exhibiting “flesh tint,” as the resultant flesh colour will look artificial. Lamp black is good for pupils, but use sparingly. To retain a smooth finish, a little linseed oil can be mixed into the colour mixture. Completing the portrait in layers will add depth to the colours of a portrait. The background to a painting is often a forgotten element when a composition is set up. An empty and featureless area could be a problem unforeseen until the completion of the painting. This could ruin the artwork, regardless of how well the objects have been painted. How does the beginner overcome the problem of empty backgrounds in a painting? The following practices are often the causes of unsatisfactory backgrounds in painting. 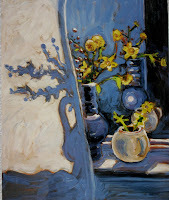 Giving sole consideration to the objects within a composition, without thinking about the background shapes, for exmple when composing a still life setting. Painting the background from memory, resulting in an idealised background which will fail to convince. A good composition in painting can be achieved if the background is given equal importance as the foreground. These two elements to a composition are known as “negative” and “positive” shapes. Positive shapes are the objects themselves. Negative shapes are the spaces in between. The following suggestions on what to do with negative shapes may help solve the problem of what to do about the backgrounds in paintings. As well as looking at the shapes of the objects within a painting, give equal consideration to the shapes of the spaces between the objects. Look out for an imbalance in distribution. For instance, is there a large area of negative space within one area of the composition? If so, rearrange the objects or shift the viewpoint. Look out for any linear echoes which may jar the painting, such as too many vertical lines which may remain unnoticed in the background until the painting is completed. Simple elements make effective backgrounds, such as a pebbledash wall or crazy paving. 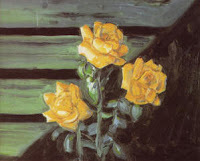 Rustic wood, brick, climbing ivy, particularly under oblique lighting, add a textural element to a painting, which can be achieved by a painting technique known as Sgraffito. To heighten awareness of backgrounds, examine photographic snapshots and look for background elements which the photographer may not have been aware of. Use the same practice when deciding on a background for a painting. What Makes a Good Background in Painting? 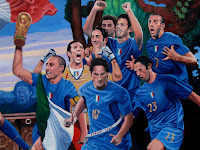 Non solid elements within a painting could create effective backgrounds if given equal consideration to solid objects. Textures in clouds, reflections in water and dappled shadows could provide a focal point. Further ideas for backgrounds for paintings could be clouds formations, such as a mackerel sky, a silhouette on a curtain or a foliage cascade. Why do My Greens Look Artifiicial? The colour green in landscape painting often poses big problems for the artist, because it is found in abundance within trees, grass and foliage. The beginner may fall into the trap of using just one green to express what should be an abundant variety of greens in nature. The resultant painting may fail to convince the viewer. Observe greens in real life. Autumn leaves contain cadmium yellow and burnt sienna; unripe apples contain lemon yellow and pthalo blue, both greens contrasting sharply. Greens can differ as much as the colour spectrum if observed closely, and will raise awareness of how greens actually look. Painting natural looking greens can be achieved by widending the green palette. This can be achieved by including two yellows, two blues, viridian and white within the colour selection. 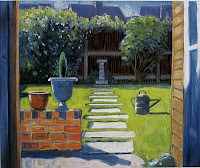 Ultramarine blue is a warm blue, and can often be seen on shadows on lawns. Pthalo blue is a cool blue, and can be seen in pine trees. Cadmium yellow is a warm yellow, which can be seen on autumn leaves. Lemon yellow is a cool yellow and can be seen on young willow trees. Viridian adds punchiness to a green mixture, but in nature, green is often surprisingly muted. Burnt sienna, burnt umber, permanent rose and violet are ideal for muting greens to express misty weather or to darken green. Using good quality bristle brushes such as ox hair will help retain an Impressionist representation of green. For detail on foliage, a thin sable brush can be used. Trees that resemble green-headed lollipops are often the result of a painter with preconceptions about how a tree should look. The greens look garish and uniform; the trunks and branches illustrated by thin brown lines. A green splodge serving merely to fill an empty area within a landscape painting is sure to spoil the effect. 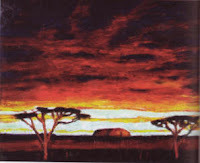 How can the artist paint trees effectively? My Youtube video provides a simple step by step demo on painting an old Lakeland tree. Try darkening green with its complimentary colour, red. Any reddish hue such as crimson or violet can be used. Apply an under wash of red acrylic paint if the painting is to feature lots of green. Allowing some of the under wash to poke through the green paint will make the painting shimmer with contrasting colours. Similarly, observe the different shapes of trees, a gnarled oak has different feel to a supple willow, or the stately cypress. A good photograph of trees will help the artist observe trees in their own right and become more aware of their varying colours and shapes. Trees appear more interesting in bright sunny weather, which adds contrasts in colour. Trees can also be made into a focal point in a painting, as opposed to a gap-filler, by placing it just off-centre of a painting composition. Adding an interesting quality such as one struck by lightning, or placed next to a ruin will encourage the artist to observe trees in a new light. Trees contain many different greens, which can be achieved by the inclusion of just two yellows, two blues and a green. These are: cadmium yellow, lemon yellow, pthalo blue, ultramarine blue and viridian green. Although viridian is often maligned for its garishness, beautiful greens will often result if it is mixed with other colours. Varying amounts of earth colours or complimentary colours such as burnt sienna or violet serves to tone down bright greens and give a muted feel, often seen in misty weather or in early winter. Good quality hog hair bristle brushes will add an impressionist feel to a painting of trees. 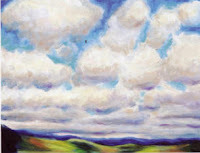 An oil painting containing skies could end up looking featureless and lifeless if the sky element is poorly observed. The colour blue looks artificial and unconvincing; idealistic cotton wool clouds ruins an otherwise good landscape painting. How can the artist make the sky look realistic within the painting? Painting with presumptions about the sky: the sky is blue, clouds are white, etc. Although ultramarine is an important colour, and can often be seen on the zenith of a summer sky, other blues such as pthalo blue, cerulean and cobalt can be seen near the horizon, and will provide interesting additions to the artist’s palette. Bright colours, such as permanent rose and cadmium yellow can be seen in sunsets. Burnt sienna, ultramarine and varying amounts of white often make a great colour for cloud bases. Good quality bristle brushes and impasto medium will create an Impressionist sky. Colour mixes in oil painting could end up looking dirty if the colour theory is poorly understood. 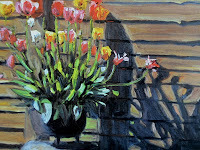 The most common problem occurs when painting shadows, silhouettes or trying to darken a bright colour. The resultant colour mix ends up looking muddy and lifeless which could ruin a painting. How can muddy colour mixes be avoided, and how can this problem be put right? A summer’s sky will appear darker at the zenith than at the horizon. Darkening blue can be achieved by introducing a little violet or even crimson into the blue mix, as red is an opposing colour to blue on the colour wheel. Introducing this complimentary colour in increments will help get the best result. Similarly, darkening green foliage can be achieved by introducing a little red. Painting shadows as pools of black or dark brown is a common mistake and will kill the life out of any painting. Looking closely will reveal a multitude of colours within shadows, including crimsons, greens and violets. A muddy splodge on a painting cannot be put right. The best thing to do is start again. This does not mean starting the painting again. The area can simply be wiped off or carefully blotted out by a process known as “tonking.” This is an oil painting technique where the oil paint is lifted off by placing a newspaper over the area concerned, pressing it down and lifting it off. This can be repeated several times until little of the paint can be lifted from the painting. With the paint lifted off, the area can be wiped gently with a clean rag to rid of any oily residue, and allowed to dry over a day or two. The area can then be begun again. Oil pigments in primary colours, which will be labelled differently according to the manufacturers. In oil, this will be pthalo blue, permanent rose and cadmium yellow (pale). In other mediums, this could include the word “process” or “permanent” with the colour label, such as “permanent yellow.” Winsor & Newton and Daler Rowney are established and trusted manufacturers in oil painting pigments.